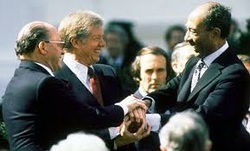 This was the first peace deal signed between Israel and Egypt. The US President Jimmy Carter hosted it at Camp David. They agreed to not make war, negotiate the refugee problem (in the Gaza Strip, the West Bank, and the Golan Heights), Israel could use the Suez Canal for trade and Israel could get oil from Egypt. But Egypt gets expelled from OPEC (Arab neighbours angry for Egypt helping Israel).